“It looked like he was going to give me a real neat show with a swoop. As he started to come down yellow pieces just flew everywhere, he just exploded and then crashed down”. Another eyewitness said she saw the plane do a couple of loops just before its left wing blew apart. Part of the problem associated with quality control is you’re hand crafting a “one-off”. No benefit of lessons learned in the production of dozens, sometimes hundreds with standard procedures along the way. Therefore, a pilot must fly between 25-40 hours of test flights in non-populated areas after passing the initial FAA airworthiness inspection. It would take a very brave person to fly even once in this. Although I’ve always subscribed to the idea that sustained effort produces results, spending ten years on a flying project is like a very long time. Yet recently, my attention was grabbed while son #3 perused one of my EAA magazines and pointed to a two passenger kit plane. “Dad, we should build one of these”, he said. Within moments, thoughts wandered to selling the current homestead, moving to the country and setting up a pole barn workshop by the house with a grass strip in back. Some, like my wife’s cousin, did exactly that – rebuilding sixteen vintage planes. There are some who seek to recreate the terrific warbirds of years gone by , albeit replicas in smaller scale. Fellow flier Tom recently discovered there’s an effort to make a mini-mini B-17. So what do you do when you’ve already built a Kitfox and a Georgia Special and your buddies (with the help of a few adult beverages) prod you to build “one last” experimental? If you are Jack Bally of Dixon, Illinois, you build a 1/3 scale B-17 Flying Fortress replica. Ideas hatched with the help of “adult beverages” sometimes sound a little less viable the morning after. Still, Mr. Bally has made progress. There’s mini home built Mustangs, Warhawks, and Spitfires. So why not a B-17 the size of a two seat Cessna? 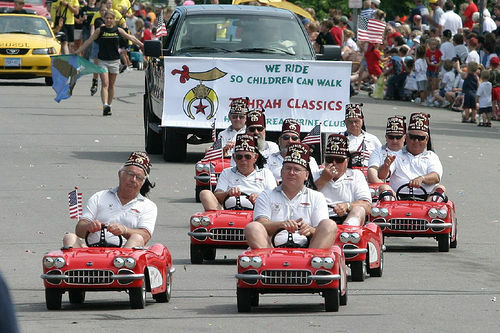 Because it’s very much like the Shriners zooming around in their miniature cars in parades. It looks just a little strange when it’s scaled back to extra small. I hope he succeeds. With ten years invested, it deserves to be in the air, not just on the ground.